Last month was one of those months that got away from me. It felt like I woke up and it was just gone and I hadn’t gotten very much done. At first, I wasn’t really sure why. The month before I had crushed it and made huge improvements in my business and fitness journey. It felt like I had lost a ton of momentum out of nowhere and I was confused about what happened. Reflecting back I realized that last month I didn’t spend any time setting or reviewing my monthly goals. It seems really clear to me that not setting and monitoring my goals for the month really impacts my productivity. I’ve developed a pretty good system for setting and following up with monthly goals over the years. I really think it works when I take the time to implement it and I’ve seen big improvements in my own life. 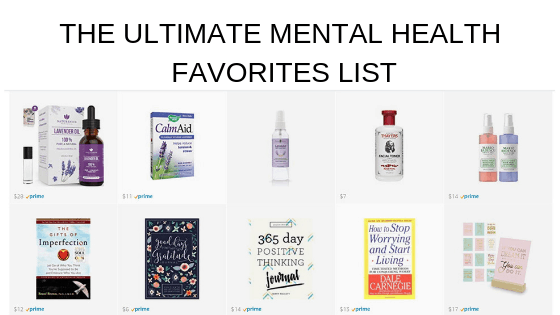 It is what helped me launch my own business and actually make my dream of being a mental health blogger come true. Here are the steps I follow every month. If you want to see more about my goal planning process follow me on Instagram stories. The biggest key for me following through on my goals is having a clear and exciting vision for the future. When I was creating this blog I had a vision of being able to work for myself, impact thousands of people and being able to make a living doing what I love. This vision was so exciting to me and it drove me to complete my goal every single week. Having a clear vision of what you want your life to look like and how it will make you feel will help you stay motivated. I like to script exactly what I want my life to be like a year from now to get really clear on exactly what my vision is. Here are some journal prompts to help you script out your future life. Give yourself permission to dream big and write out what you would want your life to look like if you believed you could have anything. You want to create a vision for your life that excites you and then set goals that support the big exciting vision you have for your life. It is now one year from now and your life is working out better than you imagined. What is your typical day like? >Where do you wakeup and what do you eat for breakfast? > What is on your agenda today? >Who do you spend your time with? >What are you most excited about? >How is your future life different from your life now? I really like writing so scripting is my favorite way to create my vision for my life. If you don’t like writing you can create a vision board (I actually do both). To create a vision board find pictures that represent what you want your future life to be like and put them all on a board. You can create a physical vision board or you can find pictures online and make a digital version. I have a Pinterest board that has all the pictures I find online that represent my dream life. I also have friends that take their favorite pictures and make them their wallpaper on their phones and laptops. The point is to put them somewhere you will see them and remember the vision you have for your life. Check out the video below if you want some inspiration for creating a vision board. Ever since I read Danielle Laporte’s book the Desire Map I set my goals based on how I want to feel. The reason we desire a certain achievement or material thing is because we want the feeling that we think it will give us. For example, maybe you want a promotion at work because it will make you feel accomplished and successful. Make a list of your the way you want to feel this month and narrow it down to one or two feelings. Once you narrow it down to one or two feelings brainstorm ways you can feel those feelings more often this month. How can you start feeling those feelings every day? What activities could you add to your routine that would make you feel the way you want to feel? I like starting my goals based on how I want to achieve rather than just making a list of things I want to achieve. Basing my actions on feelings seems more intentional to me. I like to come up with a new list of core desired feelings for each month. Having my goals rooted in the feelings I want to achieve helps me remember why I am trying to achieve each goal. I hate the feeling of reaching a goal and then not even really knowing why you wanted to achieve it in the first place. Keeping the feelings that I want to achieve in mind when I’m setting goals helps make the achievements feel more meaningful than just setting goals for the sake of it. One of my favorite books is The 12 Week Year. After I read it I started setting 90-day goals for myself instead of yearly goals. I find that setting 90-day goals gives me a greater sense of urgency than if I have a whole year to do something. At the beginning for the year, I usually spend a lot of time setting goals and intentions for the year. Then at the beginning of each quarter, I figure out what I can do in the next 90 days to move me closer to my goal. 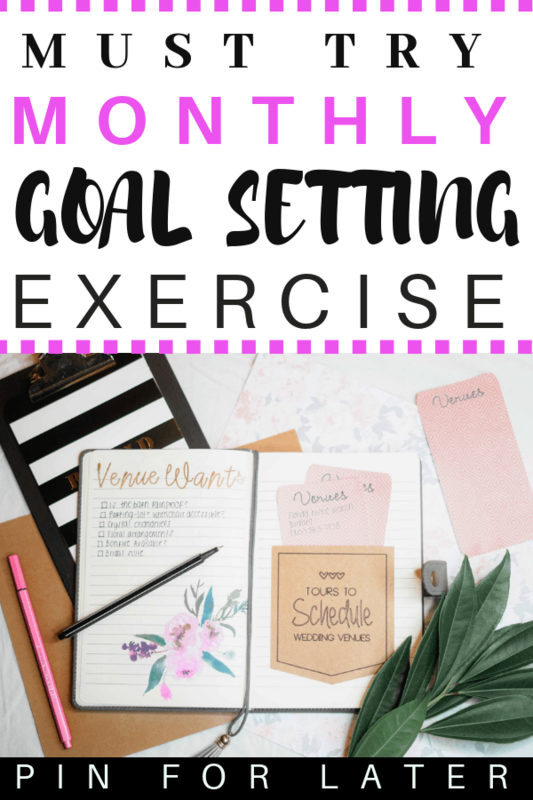 At the beginning of each month, I figure out a plan for the next four weeks to figure out what I need to do this month to make sure I’m on track for hitting my 90-day goals. This system works really well for me as long as I remember to take the time at the beginning of the month to evaluate my goals. I also spend time every week either on Sunday night or Monday morning to plan out my week. Having 90 days to achieve my goals helps me stay focused and motivated and it’s less overwhelming for me to plan out 90 days than an entire year. If you have a really huge goal I suggest using the 90-day goal planner to help you break it down into smaller steps. This has really helped me focus without feeling stressed out by how far I have to go. When I set goals I set two versions of the goal. The first version is the regular goal and it needs to be something that I would need to work hard to achieve but that feels totally possible. Once I have the regular goal in place then I set the stretch goal. The stretch goal is a bigger version of the goal. Hitting your stretch goal should feel more difficult but still achievable. This helps me really push myself and focus on going above and beyond the actual goal but lets me still feel successful even if I don’t hit the ultimate goal. I first learned about stretch goals from Ruth Soukup and she has an awesome podcast episode about it you can check out here. I don’t always hit all of the goals I set. Life happens and sometimes I don’t make as much progress as I think I will. I’m really critical of myself and it’s easy for my to beat myself up for not hitting the goals I set at the beginning of the month. However, I know that this mentality is bad for my mental health and majorly hinders my creativity and slows down my overall progress. Make a commitment to yourself to be loving and supportive to yourself throughout the goal-setting process. I always have to remind myself not to beat myself up if I don’t hit a goal. While it can be disappointing to set a goal and not hit it letting myself get into a negative mindset slows down my momentum and makes ultimately achieving my goal more difficult. When I don’t hit a goal I simply evaluate what I could have done differently and make a plan for the next month. That’s the great thing about writing new goals every month is you can carry over anything you didn’t achieve into the next month. I use my Happy Planner to plan out what I’m going to work on each week. I try to make sure I do this every Sunday night or Monday morning. I know I am way more likely to hit my monthly and quarterly goals when I evaluate what I need to do each week. It doesn’t do any good to set goals if you don’t review them and use them to plan out your projects. In general, I find that the more often I review my goals and evaluate what I need to work on the better I do at achieving my goals. I set my goals each month and then at the beginning of the week I schedule all of the action steps into my planner. If you’re looking for a goal specific planner I recommend the 90x Goal Setting Planner. I use it to set my 90-day goals but then it has daily and weekly pages to plan out how I spend my time and keep track of all the tasks I need to get done. Planning out my week helps me stay on task to hit my goals and I find the more I review my monthly goals and use them to plan my week the more I get done. It really helps me stay focused and on task when I go over all my goals every single week. Otherwise, I write all my goals in the beginning of the month but forget all about them when I’m planning my day out. What daily habits could you do this month that would help you reach your goals? I know my health supports all of my goals and quality of life so I usually include the new healthy habits I want to work on here. This month I’m focusing on drinking more water and exercising for at least 30 minutes seven days a week. meditating or getting up earlier. Figure out the top two or three habits that would make a BIG difference in your life if you did them every single day and make a commitment to doing them every day this month. I don’t usually take weekends off from my habits because I find that starting and stopping takes too much of my momentum away and I end up spending a lot of time negotiating in my mind to try and make myself do what I need to do. I always try to focus on building habits into my routine that I know will make me more successful. I know that working out every day will give me the energy I need to be successful and achieve all my goals. If you’re looking for a great book about habits this one is my favorite. Once I have my goals all planned out I like to write out affirmations for the month. If you have a hard time getting affirmations to work for you check out this article for some tips and tricks. You want to pick affirmations that are aligned with your core beliefs and that feels true to you. If you tell yourself over and over again “I am a millionaire” but you really don’t believe it the affirmation is probably not really serving you. I like to write affirmations in my journal in the mornings and I often include them in my morning pages. I have a lot of negative thoughts pop up in my head throughout the day and the bigger the goal is that I’m trying to achieve the more doubt I have. Putting affirmations in place to combat negative thoughts helps me stay positive. Whenever I have a negative thought come into my head I replace it with some of my affirmations to try and focus my mind on helpful beliefs instead. You can grab a free printable list of affirmations in the form below if you would like some more ideas. Tony Robbins says there are two things that will motivate people to make changes in their lives. To try and receive pleasure or to try and escape the pain. For example, if you were going to try and lose weight you could be motivated by the pleasure of having six-pack abs or you could be trying to get in shape to escape the pain of a risk to your physical health. Usually, the desire for pleasure will fade quickly but if someone perceives a situation as really painful it will motivate them to change. Tony talks about this in depth in his book Awaken The Giant Within if you’re interested. The way I like to use this principle to help me with my goal setting is to tap into the pain of what will happen if I don’t achieve the goal. This sounds dramatic but figuring out what the consequences are for not achieving my goals has really helped me stay motivated and focused. It’s always important to know the reason WHY you want to achieve the goal in the first place to help you stay motivated when you don’t feel like working on your goal. Everyone has times when they don’t feel like working on their goals but having a strong why can help you push yourself to keep going even when you don’t feel like it. Once you know what your goals are and what you need to do each week plan some sort of celebration for the end of the month. I love food so a typical celebration for me is usually a night out for Mexican food after I stick to my workout and healthy eating plan for a month. I get soooo excited about that meal and it’s so fun to go out to celebrate your achievement. Pick something that makes you excited that you can do once you accomplish your goals for the month. It’s important to treat yourself and celebrate your achievements every month. I hope this article gives you some ideas to help you set monthly goals. This is a practice that has really improved my life and I’ve been able to achieve many of the goals I set for myself by doing these tricks. Setting goals is one of the main ways I’ve been able to transform my mental health. It has taken a ton of hard work but I’m now able to manage my depression and anxiety and every day I wake up feeling thankful and happy to be alive. If you’re struggling with mental health I recommend setting some monthly goals for yourself and sticking to them.